Address: 683006 Petropavlovsk-Kamchatsky, K.Marksa st., 29/1, off. 213. Zapovednik Komandorsky, in the Aleutsky District of Kamchatskaya Region, was founded in 1993. Its area is 3648,7 thousand ha. The Zapovednik is located on the Komandorskye islands and the western end of the Aleutskaya Mountain Ridge; it includes the islands of Bering, Medny, Toporkov, Ariy Каmen, Bobroviye Kamni, about 60 smaller islands; and also the adjacent part of the Bering Sea (3463,3 thousand ha). Islands mostly represent the tops of an underwater ridge, with the highest point 751 m above the sea level (Stellar’s mountain). Rivers are short and shallow. Lakes are mostly of Lagoon origin. Islands are forestless. 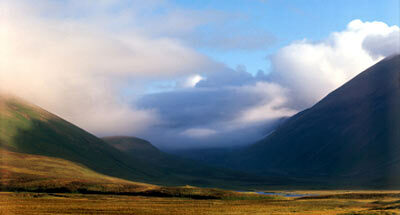 Two height belts are to be noted: bushy-meadow (till 150-200 m) that changes higher into meadow-tundra. 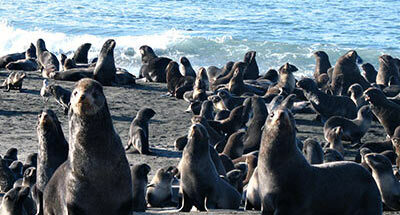 The Komandorsky Zapovednik is located near one of the most productive Districts of the world’s ocean. 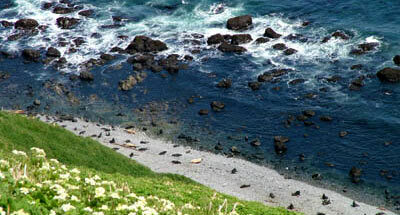 On the shore line of the islands of Bering and Medny up to 300 thousand sea mammals congregate: fur seals, eared seals, Phoca vitulina kurilensis, sea beavers. On two small islands alone — Ariy Kamen and Toporkov — tens of thousands birds nest. A significant biogeographical border goes across the Zapovednik — for 93 vascular plant species the Komandorsky islands serve as the eastern border of their distribution, and for 10 species as the western border. A great number of rare, and often endemic, flora and fauna species are characteristic of the Zapovednik. Of plant species the following are in the Red Data Book of the Russian Federation: Isoetes maritima, yellow lady’s slipper, Cypripedium yatabeanum, and Lobaria pulmonaria. Of mammals several species living in the Komandorsky Zapovednik are in the Red Data Book of the World Conservation Union (IUCH) — the sea beaver, Phoca vitulina kurilensis, Steineger's beaked whale, and the little picked whale. Steller's sea cows which have existed as a species since ancient times live here as well. Island forms of Arctic fox (Alopex lagopus semenovii) also belong to the group of rare animals. Of birds species the following are in the Red Data Book of the Russian Federation: Steller’s sea eagle, Arctic falcon, peregrine falcon. In the Red Data Book of the Russian Federation there are 15 birds species found in the Zapovednik (emperor goose, Calidris ptilocnemis, Aleutian tern, etc.). On the Zapovednik's territory there are historical and cultural monuments of the XVIII-XIX centuries.